New Delhi, April 17: Voting for Phase-II of the Lok Sabha elections will take place on April 18. A total of 95 parliamentary constituencies are going for polls across 13 states and one union territory. The polling will begin at 7 am. 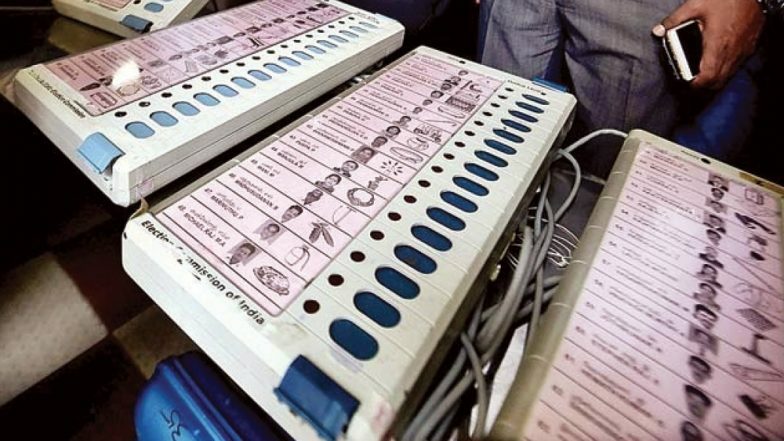 Of the 95 seats going to polls Thursday, 38 are in Tamil Nadu, 14 in Karnataka, 10 in Maharashtra, 8 in Uttar Pradesh, five each in Assam, Bihar and Odisha, three in West Bengal, two in Jammu and Kashmir, one each in Manipur, Tripura and Puducherry. The last date of filing nominations for the second phase was March 26. The scrutiny of nominations papers took place on March 27. Meanwhile, the last date of withdrawal of candidature was March 29. Lok Sabha Elections 2019 Schedule: Voting In 7 Phases From April 11 to May 19. Meanwhile, the Election Commission of India (ECI) on Tuesday deferred the polling in Tripura East Lok Sabha constituency from April 18 to April 23 due to security reasons. There are two Lok Sabha constituencies in Tripura out of which polling in Tripura West seat was held in the first phase on April 11. The poll panel also cancelled parliamentary elections in Tamil Nadu’s Vellore Lok Sabha constituency after Rs 11.48 crore cash was unearthed during the income-tax raids at the premises owned by DMK functionary Poojalai Srinaivan's brother-in-law Damodaran. After Tamil Nadu, the biggest chunk of 14 seats going to polls tomorrow is Karnataka. In the state, key constituencies to be watched out for include Tumkur from where former Prime Minister H. D. Deve Gowda is in the fray. Meanwhile, in Maharashtra, where polling will be held in 10 seats. The ruling BJP and Shiv Sena will have to defend four seats each, which they won in 2014. How to Know About Which Candidate Is Contesting From Your Constituency. Apart from Lok Sabha elections, 35 assembly seats in Odisha are also going for polls in the second phase. In the 2014 assembly election, the Biju Janata Dal retained power by winning 117 seats in the 147-seat assembly. Meanwhile, the Congress bagged 16 seats, whereas, the BJP managed to win only 10 seats. Voting for by-elections to 18 Assembly constituencies in Tamil Nadu will also take place in the second phase. In the first phase, a total of 91 Lok Sabha seats, across 20 states and three union territories were contested. In addition to Lok Sabha elections, assembly elections in four states- Andhra Pradesh, Arunachal Pradesh, Sikkim and 28 seats in Odisha also took place. The Lok Sabha elections 2019 will take place in seven phases from April 11 to May 19. The results will be declared on May 23. A total of 900 million voters are expected to cast their vote this General Election across 10 lakh polling stations. The Model Code of conduct immediately came into force after the announcement of elections dates on March 10.